Remove chicken from bag; discard marinade. 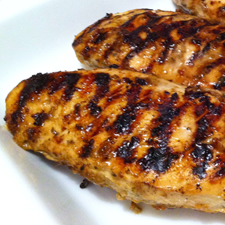 Place chicken on grill rack coated with cooking spray. Grill chicken, covered, 5 minutes on each side or until done. Garnish with parsley and lime wedges, if desired. Per Serving (per prepared 6 ounce chicken breast: 213 Calories; 3g Fat (11.5% calories from fat); 1g Saturated Fat; 40g Protein; 6g Carbohydrate; 1g Dietary Fiber; 99mg Cholesterol; 493mg Sodium. Exchanges: 0 Grain(Starch); 5 1/2 Lean Meat; 1/2 Vegetable; 0 Fruit; 0 Fat; 0 Other Carbohydrates.